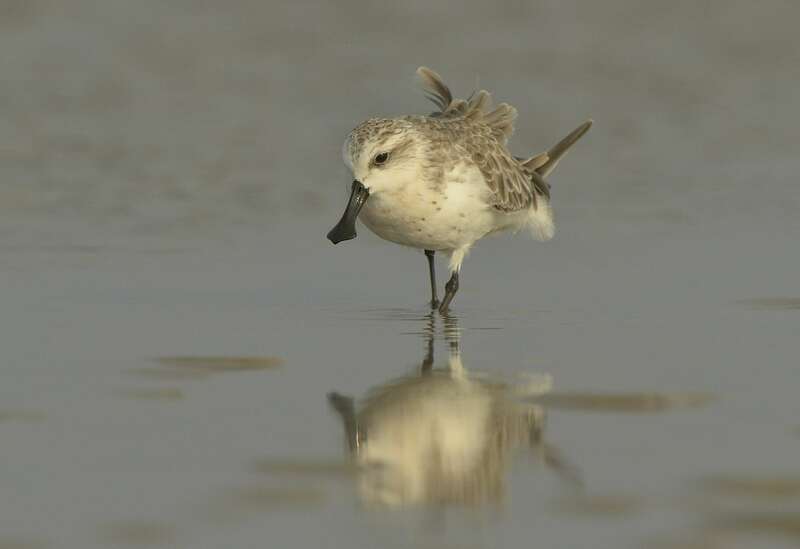 Conservationists from the Hong Kong Bird Watching Society (HKBWS), BirdLife International Partner in China, have discovered record numbers of Critically Endangered Spoon-billed Sandpipers wintering in China. On 30 December 2015, HKBWS volunteers Jonathan Martinez and John Allcock found at least 30 Spoon-billed Sandpipers near the Fucheng Estuary in south-west Guangdong Province, some of which is located within the Zhanjiang Mangrove National Nature Reserve. This was the highest number ever found in China during winter — though the record lasted less than a month. At the end of January further coordinated counts in Guangdong Province, including members from the Zhanjiang Bird Watching Society and staff from the Zhanjiang Mangrove National Nature Reserve Management Bureau. Together they counted at least 45 individuals from four locations, with Fucheng Estuary having the highest count (38 individuals). This is an extremely significant tally, given that the world population numbers fewer than 400 adults. Jonathan Martinez commented: "These numbers are a massive increase on just three individuals counted at Fucheng during our inaugural mid-winter survey in 2012. That year, we found long lines of mist-nets were found flanking shorebird roost sites. We counted hundreds of dead birds, and literally thousands of nets." Since then the Zhanjiang Bird Watching Society, and government officials from the Zhanjiang Forestry Department, have taken sustained measures to clear the illegal mist nets. In addition, there were educational activities carried out by the Hong Kong Bird Watching Society and Zhanjiang Bird Watching Society to help raise awareness to the local communities. Mr Martinez continued: "Our work has made Fucheng mudflats an attractive place for Spoon-billed Sandpiper and other waterbirds. The estuary in Fucheng is clearly of global importance for the species." Seven of the Guangdong birds were marked with coloured flags or rings on their legs. One of these was tagged with white leg flag engraved "MA", identifying it as a bird spending its second winter at the site. The unique markings enable individual birds to be tracked as they travel along the East Asian — Australasian Flyway. Dr Evgeny Syroechkovskiy, Chair of the SBS Task Force, explained: "As most of the individual birds found here are marked in Russia it also is becoming very important for development of cooperation conservation work along the lines of bilateral agreement on migratory birds signed by both the governments of China and Russia, for which SBS is the key model species. "This newly discovered wintering location is the third known biggest one in the world. This again proves exceptional importance of China for the survival of the whole Critically Endangered species."